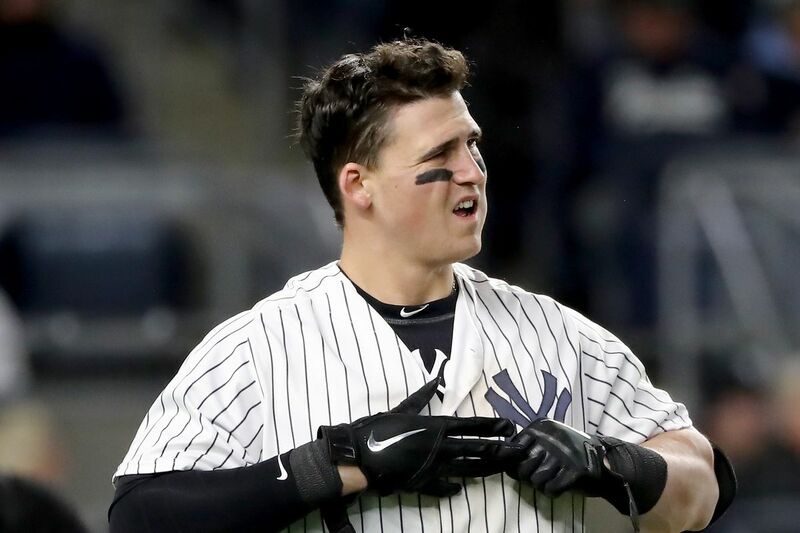 I had this post written and scheduled for tomorrow but since the Yankees hacked my account and jumped the gun with the demotion of Tyler Austin... let's just read it now and pretend that it was a premonition. As silly as it sounds to talk about fixing one of the teams with the best record in all of Major League Baseball it would be foolish to think that the New York Yankees could not be better here in 2018. Looking up and down not only the lineup, but the entire roster, there is obvious needs for improvement in certain areas, three of which we will cover this morning here on this lovely Friday. Yes, the Yankees would have five outfielders. Yes, the Yankees would be down a pitcher. What’s the difference in having five outfielders with a DH slot available when you have two left-handed first basemen also clogging up the roster? More on that later. Letting Clint Frazier rot in Triple-A while Aaron Hicks and others struggle just seems more counter-productive to me than anything. Don’t wait for an injury, send down the pitcher that never sees the mound anyway and bring up one of the best and hottest hitters the team has down in Scranton. Seems like a no-brainer to me. Designate AJ Cole for assignment, more on that later as well. I alluded to this earlier, but why does the team have two first baseman only type players on the roster at once? I understand there was a point where Tyler Austin earned his spot and made it to where the team couldn’t send him down, but we live in the now and the now states that Austin should go down for another hot and ready hitter down in Scranton. Brandon Drury is learning and playing first base down in Triple-A and would bring a right-handed compliment platoon bat for Greg Bird while also being available to play multiple other positions including third base and the middle infield. The Yankees will have to add Justus Sheffield to the 40-man roster after this season anyway to protect him from the Rule 5 Draft, why not just give him the spot now when the team designates AJ Cole for assignment? That way you can have him starting if and when an injury occurs and not a Double-A pitcher who has never seen Triple-A, let alone the Major League level, before last night. Again, no-brainer here people. Three simple tasks that make the Yankees better in the “now” and in the future. The Wild Card should not be an option for this team here in 2018, and it won’t be if these moves are made now. Get it done, Cashman. Last I checked Austin was a right handed hitter. Walker a switch hitter.